Calling all highland gals! Join us for Whacky Wickets this Spring. Make the most of the longer, warm Spring days. Six Friday afternoons. 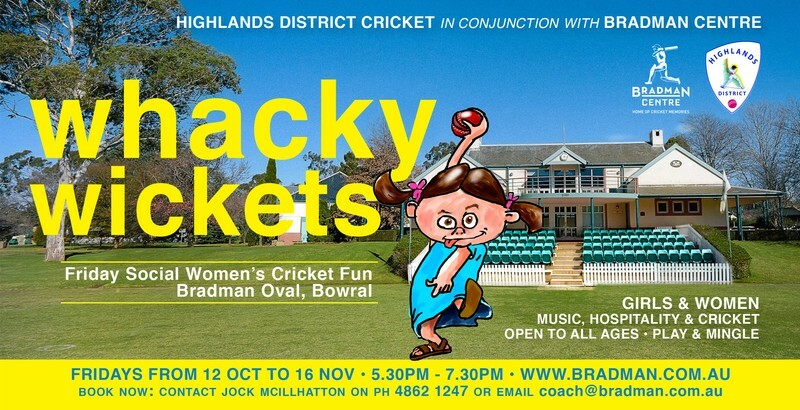 Women & girls of all ages—sisters, aunts, besties, mums & daughters—will enjoy a social night of cricket, fun, hospitality & music. No experience necessary. Fully supervised. Team T-Shirts included. For bookings & enquiries, contact Jock at coach@bradman.com.au | ph. 4862 1247. Whacky Wickets is a fun, evenly paced social modified game of cricket, perfect for girls & women to join in some social fun! Teams consist of 8 players, on the beautiful manicured outfield of iconic Bradman Oval. In conjunction with Highlands District Cricket Club.